What should you expect when buying an accessible vehicle? It's a new process for a lot of people, and it can be overwhelming.That's why we want to make your buying journey as easy to understand as possible. Here are the top 10 things to consider when buying anaccessible vehicle. When it comes to mobility assistive technology, you've got a range of options. Because disability has many variables, such as age, dexterity, and whether or not you have a caregiver, BraunAbility has dozens of options that may suit you. Consider first if you need a mobility vehicle, a full-size van equipped with a lift, or a Chair Topper. Our dealers are trained on everything BraunAbility. They know our products well, so don't be afraid to ask questions. Be transparent about your disability and your needs. There's a mobility solution for everyone, but finding the perfect option starts with your local mobility dealer. 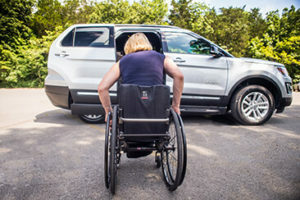 The National Mobility Equipment Dealers Association (NMEDA) is an organization dedicated to advocating for safe and reliable modifications in the accessible vehicle market. NMEDA offers a Quality Assurance Program - the only nationally recognized accreditation program for the adaptive mobility industry. Choosing an accredited dealer means you are gaining a service that is available 24 hours a day, seven days a week in case of any emergencies and provided by technicians who are trained to meet the highest standards. Know the Value of Experience. The mobility industry is saturated with second-rate "customized" accessible vehicles. You need to be wary of companies offering alterations online; finding a dealer with a track record of performance is key. Ask yourself: How reputable is the company? Do they have customer satisfaction information? Ask your prospective dealer to provide references from customers willing to talk about their buying experience and whether they are satisfied with the service they've received. Top-tier companies offering new accessible vehicles often match the warranty given on the chassis. Most often, that's a three-year/36,000-mile warranty. BraunAbility even offers an extended warranty with a seven-year/100,000-mile on a certified pre-owned vehicle, allowing you to drive away in an affordable alternative but with premier warranty coverage. When buying an accessible vehicle, there's a lot of size variations to take into account, including the size of your chair and the size of your family. For some, an SUV may work perfectly if you have passengers infrequently. For others, a van with more cabin maneuverability is a better fit. Decide Between a Rear-Entry or a Side-Entry. Accessible vehicles are modified in one of two ways-either rear-entry or side-entry. Rear-entry vehicles allow access to the rear and midsection of the vehicle, but don't allow you to ride in the driver or passenger seats. Side-entry vehicles allow access to the middle and front sections, but sometimes tight parking spaces make this modification less advantageous. There are pros and cons to each option, so be sure to discuss with your local dealer. Purchasing a modified vehicle - that is, a vehicle that has already been made accessible by a manufacturer - certainly has its benefits. Namely, convenience and the ability to see a finished product in person before buying. In some cases, you can send a vehicle to the factory to be modified, as long as the vehicle meets age and mileage requirements. Be sure to check with your dealer to find out which chassis a manufacturer can accept for modification before purchase. We call our dealers "consultants" because that is what they are: they aren't trying to sell; they are working with you to find the best solution for you. Ultimately, it's up to you, but your consultant will analyze your needs to find the perfect fit. That's why you won't find a "quick sell" in a mobility dealership. It's more likely that you'll develop a long-lasting friendship because of the amount of information you will exchange. If you are short on time, come in with a clear idea of what your needs are and what you want out of your mobility vehicle.